Download our one-page overview of Missouri's trespassing laws. As you search for rural property or look for places to hunt, it is important to know the trespassing laws. Download this white paper to get a better understanding of your rights as a landowner and hunter. "In Missouri, a second-degree trespassing charge can occur when someone is unknowingly on another’s piece of property. 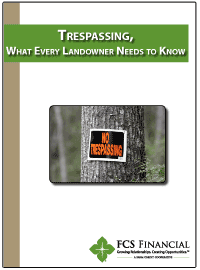 The landowner does not have to post “No Trespassing” signs, put up fences, or use purple paint."